Westwind Graphics makes full color printed banners in many sizes (from your artwork or ours) Scroll down page to see prices of many common sizes. If you do not see just give us a call we make them as large as billboard sizes. Banners are one of the best ways to advertise and promote your business to the public. Printed on 13oz premium matte vinyl. Banners are sent out hemmed and grommeted with brass grommets approx every 2 ft unless otherwise requested. Other finishing methods available: Pole pockets, hem on top and bottom only, hem on sides only, grommets in corners only, etc. Pretty much whatever you need. 2' x 4' Vinyl Banner 13 oz. 2' x 6' Vinyl Banner 13 oz. 2' x 8' Vinyl Banner 13 oz. 2' x 10' Vinyl Banner 13 oz. 2' x 12' Vinyl Banner 13 oz. 2' x 14' Vinyl Banner 13 oz. 2' x 18' Vinyl Banner 13 oz. 2' x 20' Vinyl Banner 13 oz. Yes! We do larger and longer banners. Give us a call 800-423-7492 for a quote. We can make horizontal or vertical banners. We add hem and grommets or we can do other finish styles such as boulevard banners, retractable pull up banners with a stand, hems on top only, hem on side only, pole banners, hem with rope, windslits, etc. 3'h x 4'w Vinyl Banner 13 oz. 3'h x 6'w Vinyl Banner 13 oz. 3'h x 8'w Vinyl Banner 13 oz. 3'h x 10'w Vinyl Banner 13 oz. 3'h x 12'w Vinyl Banner 13 oz. 3'h x 14'w Vinyl Banner 13 oz. 4'h x 4'w Vinyl Banner 13 oz. 4'h x 6'w Vinyl Banner 13 oz. 4'h x 8'w Vinyl Banner 13 oz. 4'h x 10'w Vinyl Banner 13 oz. 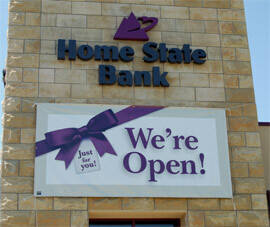 4'h x 12'w Vinyl Banner 13 oz. 4'h x 14'w Vinyl Banner 13 oz. Files we accept are eps, ai or pdf. Text: Convert ALL typefonts to outlines or send us the font files. Allow 3" from final size for 1" all around folding over and hemming (unless you are not having it hemmed). Westwind Graphics makes vinyl printed banners of all sizes.